You Must Create is the front runner in London for wearable but directional collections of clothing. On a continuing level, YMC is known for its developed signature looks, and its continual inspiration deriving from art and music. 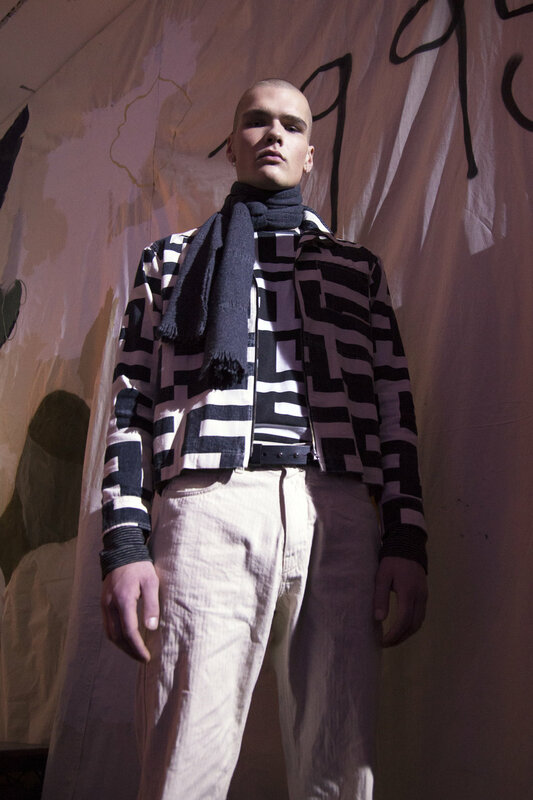 For Autumn/Winter 2017, Creative Director Fraser Moss looked to the Bauhaus movement for inspiration; an architecture movement focused on form and functionality, a structure that YMC followed for its LCM presentation. Set in a downstairs store space in Covent Garden, the space was dimmed and alike to a well lit club. The set design included a back drop that read ‘Traum der Maschine’ (English: Dream Machine), inspired by Berlin in the late 1970s and early 80s, and an apt title for a collection sound tracked by Factory Floor, the post-industrial, electronic band. The fundamental DNA of YMC clothes lies in Moss’ ability to drive influences into clothes in a generally unobvious way, but in a very subtly apparent way for those who know. Moss’ fascination with Bauhaus led him to create Autumn Winter clothes that are functional, unisex, understated and highly wearable. An array of male and female models stood dancing in natural time to Factory Floor’s electronic sounds, sporting army basics including sheepskin flight jackets and heavy jersey sweaters, as well as elevated basics such as wool Breton tops, suited trousers and formal dresses in black, grey, olive, camel and orange. What is most inspiring about YMC is its willingness and its achievement in making clothes look so effortlessly easy to wear. Male models stood in berets, another in a speckled wool coat, and another in a sheepskin jacket, another in the signature YMC woollen factory coat, and others in uncomplicated zip shirts. The women wearing a combination of melton trousers, fishtail parkas and tailored duster coats. Although these pieces are easy to wear, there is nothing easy about the thought behind them. There is a well-defined range, and both wardrobe essentials and standouts within one collection of looks. Moss does an excellent job at making his incredible array of references into one compact story, and a story that is wearable for longer than a six-month cycle.